Planning a rebreather dive is a little bit more complicated than planning a normal open circuit dive. This articles describes how to do all the steps and why they are done. Do you plan every single open circuit dive in advance? If you have some diving experience you probably know that on any dive shallower than 20 meters you will run out of air before you will experience any problems and you won't bother looking at tables until you might go for a second dive that day. Even dives down to 30 meters are quite safe if you use a normal 12 liter cylinder filled to 200 bar since you will run out of air before you expose yourself to too much nitrogen. Diving with a semi-closed rebreather is a little bit different. The reason for this is that you have to make a decision on what percentage of oxygen you will dive on. A random decision will most likely give you too little or too much oxygen with fatal consequences. Using 60% oxygen will limit you to 13 meters depth but you will have more than 2 hours of divetime. Using 32% oxygen will let you go down to 33 meters but wil limit your time divetime to less than an hour. The diagram below shows how divetime decreases as depth increases. The line with orange dimonds shows how your air consumption increases with depth. The line with dark blue diamonds shows how your nitrogen no decompression time limit increases with depth. 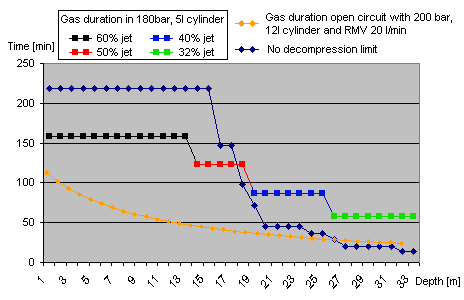 The line with squares shows the gas consumption for a semi closed rebreather. Note that on depths deeper than 20 meters it is quite easy to stay so long on a single dive that you have to take decompression into account. This step does not involve any calculations but it does involve some thinking ahead. Quite often you fill your tanks at one place and then go diving with other people the day after. Since you need to know your mix the day before the day you may have to give your dive buddies or the remote divecenter a call to check up the dive site. For instance it would be pretty poor planning if you fill your tanks with a fat 60% mix only to find out at the divesite that the exceptionally cool wreck is located at 30 meters depth. 60% oxygen means a maximum depth of 13 meters which probably won't give you the best view of the awesome wreck. When you have decided what your maximum percentage of oxygen is you may want to round it down to one of the preset mixes for the Dolphin rebreather which are 60%, 50%, 40% or 32%. The reason for rounding it down is to allow you to go a few meters deeper than planned but still maintain enough oxygen in the system for the shallow part of the dive. If you know you will have a heavy workload, like swimming against a current, then it is recomended to maintain a slightly higher oxygen percentage to avoid getting too little oxygen on the shallow part of the dive. Now when we know our EAD we can use a standard divetable to look up our maximum time on the depth. Example: Using our PADI divetable we can see that the closest depth above 11 meters is 12 meters. 12 meters gives us 147 minutes divetime without requiring any decompression stops. Now we have seen that our gas will last for 123 minutes and our no deco time is 147 minutes. The final things we have to think about is that we won't exceed our scrubber duration or maximum oxygen exposure time. The scrubber will last for 3 hours filled and 1 hour half filled (using half fill equipment) so we are fine as long as we use the full scrubber canister. We calculated our maximum depth based on 1.4 ppO2 which means a maximum exposure time of 150 minutes. The conclusion of these facts gives us that our divetime will be limited by our cylinder duration of 123 minutes.